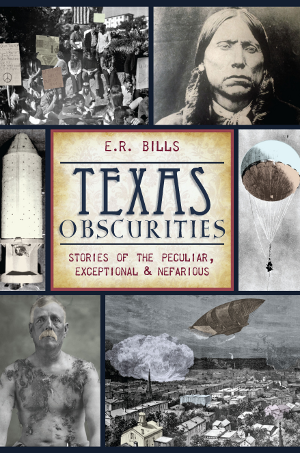 Some of these quirky true stories might surprise even the most proud Texan. Austin sat the first all-woman state supreme court in the nation in 1925. A utopian colony thrived in Kristenstad during the Great Depression. Bats taken from the Bracken and Ney Caves and Devil's Sinkhole were developed as a secret weapon that vied with the Manhattan Project to shorten World War II. In Slaton in 1922, German priest Joseph M. Keller was kidnapped, tarred and feathered amid anti-German fervor following World War I. Author E.R. Bills offers this collection of trials, tribulations and intrigue that is sure to enrich one's understanding of the biggest state in the Lower Forty-eight. Born in Fort Worth and raised in Aledo, E.R. Bills received a degree in journalism from Southwest Texas State University in 1990. When he's not wandering Texas back roads, he does historical, travel and editorial writing for publications around the state.